La Via Campesina TV: June 2013 : Follow the VI International Conference of La Via Campesina! You are here: Home > HIGHLIGHT > June 2013 : Follow the VI International Conference of La Via Campesina! June 2013 : Follow the VI International Conference of La Via Campesina! 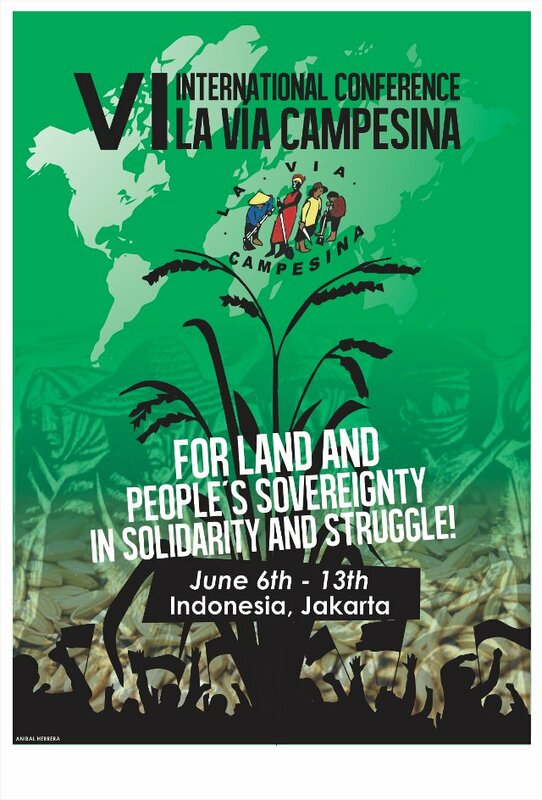 (Jakarta, 14 May 2013) About 500 peasants, who are members of more than 150 organizations spread throughout 70 countries across the world, will convene in Jakarta, Indonesia between the 6th and the 13th of June for the VI International Conference of La Via Campesina. This conference will be preceded by the International Youth Assembly and the International Women’s Assembly. These international conferences are held every four years, and consist of the highest body through which collective decisions are made and debates held, giving way to the creation of a common mobilization agenda for the peasant movement. During the VI International Conference, peasants from around the globe will analyze the current international situation, the impact of land grabbing, the green economy, transnational companies and neoliberal policies affecting food sovereignty, land, water, seeds, biodiversity and life itself. The opening ceremony for the VI Conference will take place on June 9th, and will gather thousands of participants as well as national and international personalities. During the last twenty years, Via Campesina has held five international conferences. The first in Belgium in 1993, followed by Mexico in 1996, India in 2000, Brazil in 2004, with the last one being held in Mozambique in 2008 – all of which accompanied the fights and struggles of people from every continent, and served to strengthen the peasant movement at a global level. June 13: Visit to a peasant village in Sukabumi. Interview with the general coordinator of La Via Campesina, Henry Saragih realized by World Real Radio in Jakarta, Indonesia, June 2013.